TravelsinTaste.com recently had the pleasurable opportunity to chat with Executive Chef Michael Bloise about Wish and the whimsical creations that come out of its kitchen. We had so much fun chatting with him, in fact, that we had not just one conversation, but two. First, we discussed Chef Bloise's cuisine, including his favorite flavors and techniques. Then, in our second conversation, we tackled his passions, his restaurant and the experience that he wants all his customers to have. For our first conversation, please read below. For the second, please click here. Meanwhile, please click here if you'd like to read Chef Bloise's bio, or click here if you'd like to view one of his recipes. Otherwise, if you'd like to read the full listing for Wish, including its dinner menu, please click here; you can click here for the breakfast menu or here for its lunch menu. Because Wish offers such an unusual melding of flavors and tastes, we asked Chef Bloise what influenced his menu choices. "The interesting thing is that I totally believe that the food in a restaurant has to match the ambience and the atmosphere," he told us. "The ambience at Wish has a very feminine quality to it, if you will. There's lots of foliage; it's almost like an enchanting garden. It just turns out that that's the food that I like to cook. I used to be at Wish as sous chef; then I left, went to another restaurant and ultimately came back as executive chef. I developed my style when I was a sous chef. When I came back, my style really fit the atmosphere of Wish, so I chose that cuisine because that's how I cook naturally." With so many unique items on his menu, Chef Bloise's favorite to prepare is less about a single dish -- his favorite selection changes often, he says -- and more about how it's cooked. "I love braised," he says. "My favorite dish to prepare now is braised short ribs. The reason I love braised is because braising is the underdog. Traditionally, braising is the tougher one, the piece of meat the rich people didn't want. The peasants had to find a way to cook out the flavor because it's tougher. You really have to know how to cook it and braising it is an art, whereas grilling a filet mignon -- well, anyone can do that. Braising really takes talent, time and patience. "I have braised short ribs on the menu. I braise them with pineapple, cilantro, veal stock and a lot of white wine, as well. I don't braise it all the way, though. Normally, most people will braise the meat until it's just falling apart. I under-braise it, trim off the bone, then finish it on the grill. This ensures it has a crispy outside. I slice it really thin and serve it with a guava glaze and sushi rice, with some different vegetables; it has a very Japanese style presentation." You can tell that Chef Bloise really enjoys braising. He does it in a unique way; it seems second nature to him. 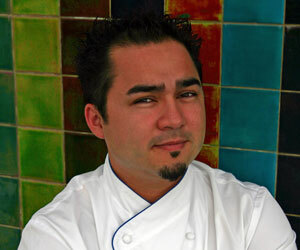 We wondered, then: If braised short ribs are his favorite dish to prepare, what's his most challenging? "The most challenging dish to prepare is probably the dish that represents my own personality the most," he says. "The foie gras dish. It is a bit of a complex dish. Normally I would keep things very simple, but this one is pretty intricate. I start with bananas that are diced and sauteed with a little bit of honey butter, then finished with a syrup I make from Casterval chiles, and put that on a plate. Then, on top of that, I place a honey wheat crouton -- whole wheat bread with honey butter, toasted. On top of that I place a little salad chiffanade of basil, arugula and julienne of daikon radish dressed with orange juice, hazelnut oil and black pepper. On top of that I place a deliciously, perfectly seared piece of foie gras. Finally, on top of that I place a marshmallow that we make with black peppers, which gets toasted with a little bit of basil, and that finishes the plate. It's one of those dishes that when I'm teaching plate composition to my guys in the kitchen, I try to explain to them that you can't have too many flavors; it's going to confuse the palate. Every now and then you can get away with a perfectly balanced dish and this one really works. There's a lot going on, but it's so well balanced that it comes off a winner."